Picture a major organization with a head office, three regional offices, 319 affiliates and three high-level training facilities looking for people to provide informed, expert, skilled leadership. Although a paid staff handle day-to-day operations, the direction and oversight comes from volunteers. The organization is a major distributor of God’s eternal gifts of salvation and forgiveness. This is Lutheran Church–Canada—your church entrusted with God’s mission—and currently seeking leadership volunteers. During next year’s Synodical Convention in Hamilton, Ontario, delegates will need to elect 18 people to serve on the church’s various boards and commissions, including the Board of Directors. 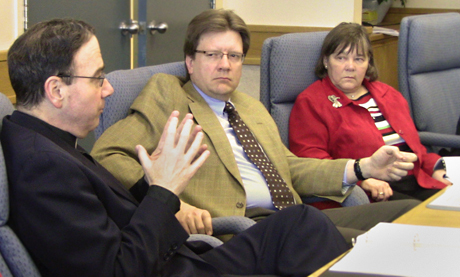 Arnold Drung and Anne Taylor listen as President Bugbee (l) adds to the discussion at a recent Board of Directors meeting. For almost six years, Allen Schellenberg (Trinity, Richmond, B.C.) has served on LCC’s Commission on Theology and Church Relations. The commission provides theological guidance and evaluates inter-church relationships. Mr. Schellenberg, who was a salesman when he was first elected, says he has been “blessed to be a part of this process [which has] involved the study of God’s Word, and working with individuals who share a common concern for the application and practice of God’s Word within LCC. To submit your name or the name of someone whom you believe may be qualified to serve on one of LCC’s boards or commissions, you can look at the qualifications and submit a nomination online at www.lutheranchurch.ca/ The deadline is September 30, 2010.